Hi, in this post I would like to show how Portal users can leverage SAP Jam to add collaboration capabilities to their Portal sites. The SAP Cloud Platform (SCP) Portal provides flexible UI tools for building great looking business sites that bring together business applications, data and web content. With the Portal you can integrate various tools and services delivered on SCP harmonizing them to create comprehensive business solutions. 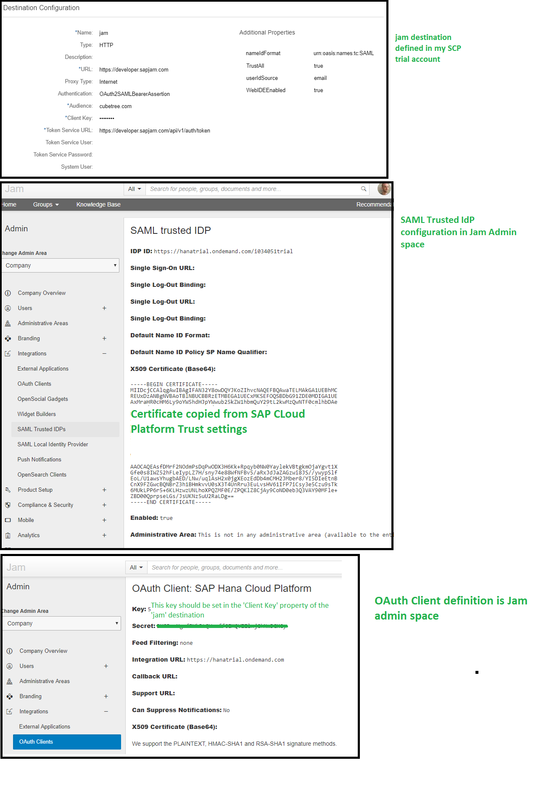 In this first part of the post, I’d like to show how SCP users can leverage their SAP Jam account to add collaboration capabilities to their Portal sites using out of the box integration and custom development. 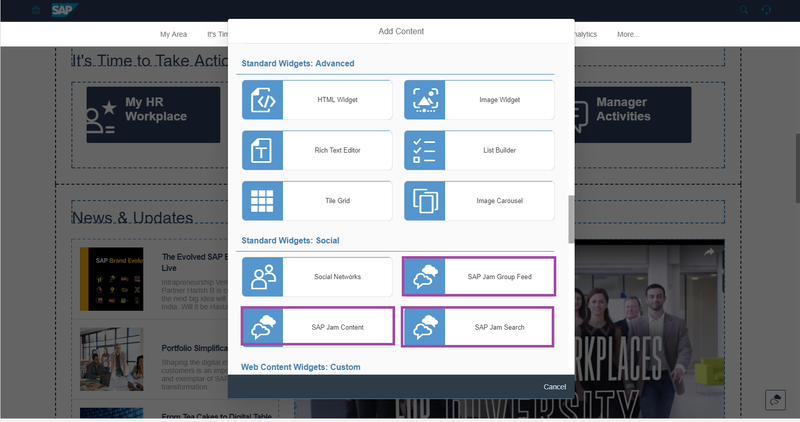 In the second part, you can follow a step-by-step guide to integrating SAP Jam Embeddable Widgets into your Portal sites. 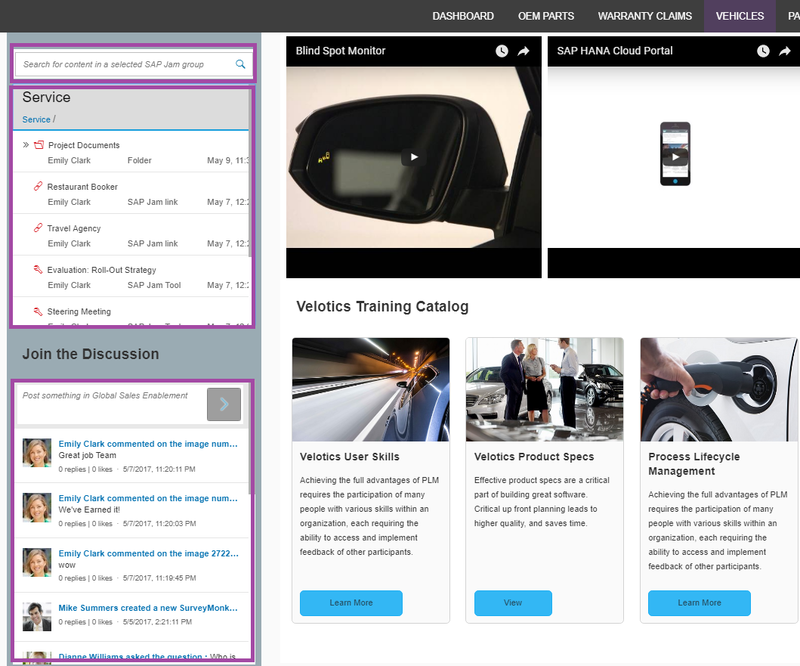 The SCP Portal service offers two main user experience options – Fiori Launchpad Sites for application and process centric solutions and Freestyle sites combining business applications with web content in a flexible custom web site design. Both offer different integrations with SAP Jam out of the box. Displaying the user’s profile picture from SAP Jam on the Launchpad’s ‘ME Area’. – this capability has recently been removed in compliance with GDPR. A jam notifications tile displaying the latest notifications received in the user’s SAP Jam account. A dedicated tile for each one of the user’s Jam groups. The tile displays information about the time the last group activity occurred and users can click on it to navigate directly to the SAP Jam group. In addition, Share and Discuss capabilities are added to Launchpad applications enabling end users to communicate with a particular SAP Jam group. SAP has enabled these collaboration features in the productive Fiori Launchpad site that it offers its 70,000+ employees – as can be seen in the screenshot. The Launchpad enables users to easily access self service transactions (like managing time-off, viewing pay slips etc.) from any device within or outside the corporate network. 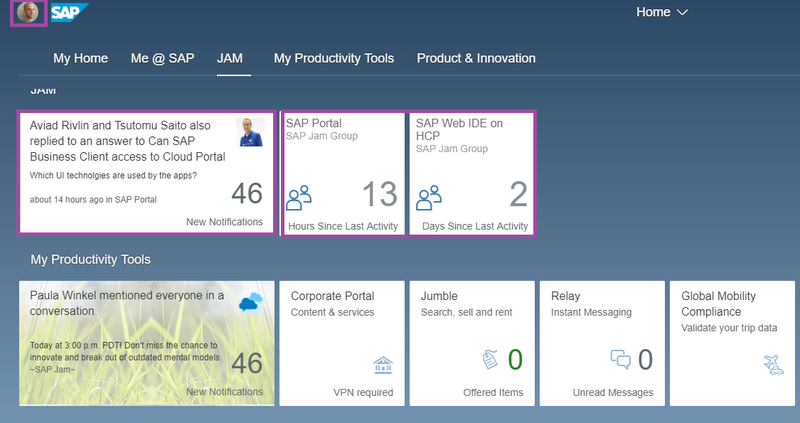 To enjoy this integration in your Fiori Launchpad sites portal admins need to complete the SAP Cloud Platform and Jam integration configuration and specifically enable Jam Integration in their Launchpad site settings configuration. For more information on this configuration click here. Once this configuration is completed and Jam integration is enabled, the SAP Jam Content Catalog is assigned to the Launchpad and end users can select their Jam tiles from the Launchpad App Finder and add them to their home page. Search widget that allows end users to search through the content of their company JAM account (restricted to their permissions of course). 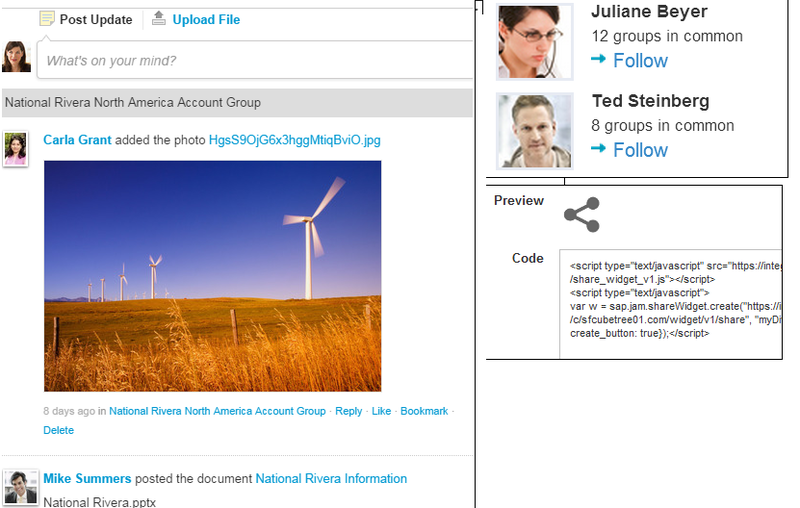 Group Feed Widget displaying the feed from a selected Jam group and allowing users to interact and post their comments. Content widget displaying the documents, folders and resources of a selected group allowing end users to download or access them in their Jam account. For more information on Jam integration with Freestyle portal sites click here. The SAP Cloud Platform provides development tools and runtime environments that users can use to develop and run their own custom collaboration experiences with Jam in their Portal sites. SAP Jam provides extensive OData APIs. SCP users can develop their own integration experience by developing custom apps in their SAP Web IDE. Using the platform’s connectivity service your custom app can easily interact with Jam OData endpoints. Finally, add the custom app to your portal sites as a widget or shell plugin and provide your end users with a custom collaboration experience. For more information on SAP Jam OData click here. However, I did some digging, and found some more recent documentation here: https://help.sap.com/viewer/u_collaboration_dev_help/d86e7d9450ac48b59049a9c75a8b1363.html where some of the details are different to the documentation you pointed to. So I followed those instructions … three times … and still no success – the SAP Jam Content Catalog doesn’t show up in the App Finder. Can you please let us know what we might be doing wrong? Thanks Ido, that’s very helpful. With the screenshot you provided, and a re-reading of both (conflicting) sets of documentation, I got the “SAP Jam” catalog to appear (as well as my photo avatar appearing in the FLP). This is a good step forwards! The SAP Jam developer documentation uses a different destination name because it’s used for the exercise to access SAP Jam APIs from the Web IDE. The only other difference I see is the URL: The Portal documentation uses jam4.sapjam.com but when you use the SAP Jam developer edition it needs to be developer.sapjam.com as Ido mentioned. The sub-domain here indicates on which datacenter/landscape your SAP Jam tenant is located. If you have more things that are wrong about our SAP Jam developer document, we’d love to hear about it, so that we can fix them. I have integrated jam to my cloud account, but not able to see my pic on SCP FLP site. create account in sap jam. uploaded the profile pic in jam. but it is not reflecting in flp site after publish, am I missing anything here? Thanks for putting this together Ido! I’ll try this out this week with my trial instances.